Talented Hong Kong LEGO builder Alanboar Cheung honeymooned with his wife in Kyoto, where the newlyweds visited Kiyomizu-dera, an early Buddhist temple founded in 778 AD, with the current buildings dating to the 17th century. Alanboar has commemorated their trip as a gift for his wife with this beautiful LEGO creation. Chock full of details depicting elements of Japanese culture, the whole creation sits on a brick-built scroll, complete with a calligraphy brush in front. The model features the main temple building on its hill, the accompanying pagoda, and the waterfall that gives the temple its name. 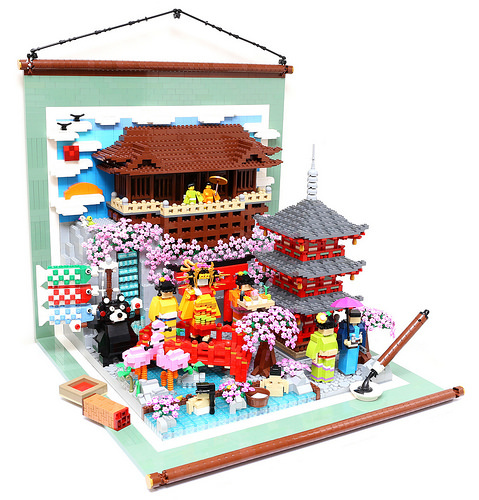 In addition, Alanboar included LEGO recreations of his favorite memories, from Kumamon (the mascot of Kumamoto Prefecture, which is nowhere near Kyoto) waving Japanese flags beneath cherry blossoms and a trio of Children’s Day carp flying above to a beautiful princess on a bridge overlooking a couple basking in a hot spring (sadly without any snow monkeys). There’s a lot going on here, so be sure to check out more photos on Alanboar’s blog. And if you enjoy this, you’ll also appreciate Alanboar’s LEGO mosaic of Hokusai’s “The Great Wave Off Kanagawa” we featured here a few months ago. Oh wait, you’re right, it is Kiyomizu-dera! I saw this picture a few days ago, and I just assumed it was a random collection of traditional Japanese things. I guess Kumamon and the koinobori are the ones who misled me.